The Frikon Pop-Up Beach Shade - Beach Tent, pops open instantly, transforming into a screened-in 6' x 6' x 6' room that quickly pops open and is ready for use in mere seconds. An ideal beach tent, the pop-up screen room offers excellent protection from the elements. The fully-opened room has mesh sides and a fabric top to provide a breezy shelter that stays cool but blocks out sun and insects at the beach, in the backyard, at a park, or wherever you take it. No flooring makes the Pop Up Beach Tent easy to set up anywhere! Easy access with a zipper door. 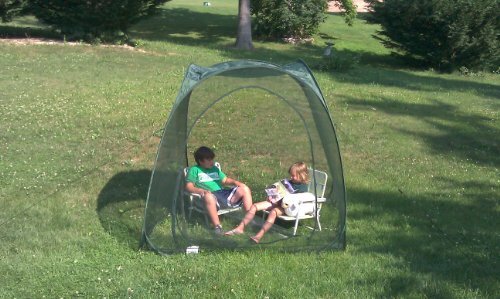 Great for children who are spending time in the outdoors and need a safe haven from the elements. The Pop Up Beach Tent is also great for pets at the beach or park, giving them room to relax, yet keeping them close. If you have any questions about this product by Frikon, contact us by completing and submitting the form below. If you are looking for a specif part number, please include it with your message.